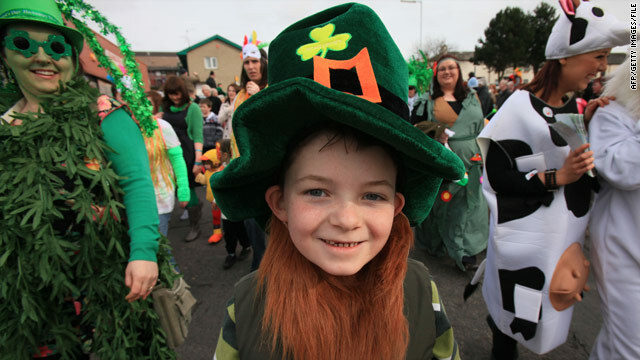 Patrick Sullivan of Downpatrick, Northern Ireland, walks in last year's St. Patrick's Day parade in Downpatrick. To Irish Catholics, St. Patrick's Day is not just a day for green beer and ridiculous hats. It's the feast day of their nation's patron saint. According to Catholic.org, Patrick was born to Roman parents in occupied Scotland in the year 387. He was kidnapped and taken to pagan Ireland as a slave at age 14 but escaped and returned to Great Britain at age 20. He entered the Catholic priesthood and eventually became a bishop. In 433 he was dispatched back to Ireland, where he used a shamrock to illustrate the concept of the Holy Trinity. Virtually the entire population of the island converted to Catholicism. He died on March 17, 461 (some sources say 493). The former player and current minor-league manager for the Atlanta Braves was expected to be released from an Orlando, Florida, hospital Thursday. Surgeons on Tuesday removed Salazar's left eye, which was severely injured by a foul ball last week. Salazar, 54, was standing in the Braves dugout during a spring training game when a line drive off the bat of catcher Brian McCann struck him in the face and knocked him unconscious. It was initially feared that Salazar's life was in danger or that he would suffer brain damage. "We're lucky he's alive," Braves General Manager Frank Wren said Wednesday. "Despite the best efforts of really skilled eye specialists here in Orlando, they were not able to save his eye." Salazar, in his first year with the Braves organization, is expected to take up his managing duties with the team's Lynchburg, Virginia, farm team in four to six weeks, Wren said. The senior pastor of the Crystal Cathedral in Garden Grove, California, has apologized for asking members of the church's music ministry to sign what some view as an anti-gay document, the Los Angeles Times reports. "I understand that in an era where images of family relationship and personal sexuality are often confused, Crystal Cathedral Ministries believes that it is important to teach and model the biblical view. I understand that Crystal Cathedral Ministries teaches that sexual intimacy is intended by God to only be within the bonds of marriage, between one man and one woman." Several choir members objected, and some threatened to quit the ministry. Even the Rev. Robert H. Schuller, the church's founder and the pastor's father, was offended. "I have a reputation worldwide of being tolerant of all people and their views," he told the Orange County Register. "I'm too well-educated to criticize a certain religion or group of people for what they believe in. It's called freedom." Coleman backtracked Tuesday and issued an apology: "The church of Jesus Christ at large is grappling with the challenge of reconciling love and adherence to God's word, even those passages that challenge us," she said, according to the Times. "As the church has been engaging in this sensitive dialogue, people that we care for deeply have been hurt. We are sincerely sorry." Why should a pastor apologize for teaching what Christ would have her teach? If gays don't like what is preached in church, they can stay home. It is what it is whether they like it or not. It's not about hatred or intolerence, but about what is written. If they ignore doctrine for the sake of hurt feelings, then they are not a church of Christ. Lies make Baby Jesus scream like a whale. Offtopic – you're right, the church has the right to espouse their beliefs and ask those who "work" for the church to comply. However, it doesn't mean that the church should then be insulated from criticism. What they did was plainly and simply just mean – I'll never set foot in the place and if I was singing in the choir I would have been out of there when this issue first reared it's ugly head. @Offtopic...I agree. It doesn't take a rocket scientist to understand and come to know God's word. If you don't like what it says, ignore it and keep doing what you are doing. Don't try to twist it into something it's not. It was written so that people living in our time might have a true hope for the future: living forever on a paradise earth. What better hope is out there for our future? Not many in America know the story of St. Patrick. He was a good man who converted the Central and the North of Ireland to Christianity and thus uniting the country by religion. Maybe if more Americans were properly educated and learned their history better,some of these right-wing politicians wouldn't get elected to office and the Tea Party Movement wouldn't flourish like it does. And there he goes again. I thought I was weird, but compared to you I'm normal. What does an Irish guy have to do with "right-wing" anything. Dude, you are embarrassing yourself. Please use your own name, Sillie Boy! Leave me out! Bloggers are complaining to me. No Phunnie boy,you missed Cesar's point here. Cesar was talking about the ignorance of Irish history of the majority of the American people today. Do you know anything about the history of Ireland,Phunnie boy? why do so many want to be irish on st patricks day but they dont wanna be black on mlk day? lucky charms! Even my weener is leaking green today! Please Phunnie boy,use your own name if you want to post your Tea Party jokes here. Since we're discussing St. Patrick today,the Tea Party lingo definately has no place here. Nobody wants to be Irish, not even the Irish. Haven't you heard? The only thing smarter than a dumb Englishman, is a smart Irishman. And a Happy St. Patrick's Day to all! They'rrrrrrrrrre baaaaack. Troll alert. @Cesar of 1:27 you are not only not funny, but you are an idiot. @Cesar of 3:46: For once I agree with you, Tea Partier. It doesn't matter how you preach or teach about GOD .Just do it ! icupfunnycolor1 on May 15, 2011 thamks man but i cant seem to find my ceannhl to turn off my tv. i pressed up . and down . multipil times and it still didnt turn off. please help.